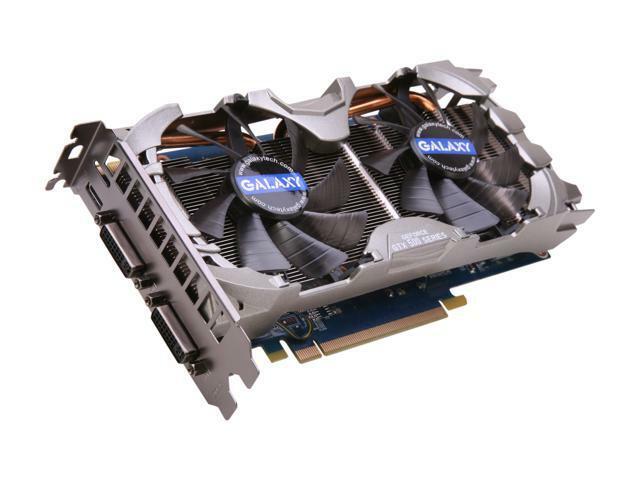 The Galaxy GTX 560 Ti GC is built with a custom aluminum “twin blade” cooling system with dual 90 mm silent fans, gaining up to 10’C cooler and 11db quieter versus the original reference cooling system. Like all GeForce GTX 500 series GPUs, the GeForce GTX 560 Ti has been crafted to deliver more performance while consuming the least amount of power possible. With amazing DirectX 11 tessellation performance, the Galaxy GeForce GTX 560 Ti packs highly detailed visuals into your games - without sacrificing high frame rates. And with NVIDIA 3D Vision, PhysX, and CUDA technologies, the Galaxy GeForce GTX 560 Ti powers all of the incredibly realistic effects that your games can throw its way. Superior Heat Dissipation Thanks to the aluminum “twin blade” cooling system with dual 90 mm silent fans, the Galaxy GTX 560 Ti GC achieves up to 10’C cooler and 11db quieter compared to the original reference cooling system, unleashing the potential of the GTX 560 Ti GPU. NVIDIA 3D Vision Ready NVIDIA 3D Vision brings a fully immersive stereoscopic 3D experience to the PC. A combination of high-tech wireless glasses and advanced software, 3D Vision transforms hundreds of PC games into full stereoscopic 3D. 9.33" x 4.33" x 1.57"
Cons: This card delivers horrible performance. Mixed with an AMD FX 4 @ 4.2GHz, this card consistently delivers less than 30 frames per second on some of the least demanding games on medium-high quality. Approximately 20 fps in Minecraft without mods and less than 10 fps in Euro Truck Simulator 2. Other Thoughts: Hugely disappointed. All of the reviews and benchmarks were way wrong. Not worth even $50. Pros: great upgrade card for an older system. Cons: after a year and a half the card literally flared up like a sparkler while i was playing star trek online. i got lucky i had a case that i could get to the insides quickly. pursuing galaxy currently to find if i can get a RMA thanks to the 2 year warranty. Other Thoughts: i may have just got a defective card, would still buy again though. Pros: I bought 2 of these cards for SLI. My PCI-E slots are quite close together so when I put the cards in, they were only about a centimeter apart. The first card heated up enough to fry an egg and there was no real solution. I even tried putting a 120mm fan blowing direct air at the cards and still no luck. In a one card configuration, the card will run very very cool, but in SLI the card on top will burn from the lack of airflow. I ended up modifying an Antec Kuhler 620 onto the first card and now they are running fine. Cons: SLI-ing them was a hassle for me. Don't SLI them unless you have a lot of space between the cards or unless u plan on water cooling somehow. Other Thoughts: They perform amazingly, I plan on water cooling my second card once I get some spare pocket money. I have a feeling they will last me for a long time. Pros: Wicked quiet. Tested with Tera and Guild Wars2 on max settings. Didn't skip a beat. Didn't even get loud under load. Other Thoughts: One of the stand-offs on one of the DVI ports was loose. Only took a couple seconds to tighten. Pros: This card served me wonderfully for 18 months of heavy use. I eventually choked it to death with dust (totally my fault), but prior to that it was quiet, efficient, and kept itself cool. If the 560 ti's weren't now discontinued, I'd probably just replace it with another. Cons: None. This card has rocked. Pros: This card runs smoothly with OS X Mountain Lion. Very fast and runs very cool as well. Comments: If you have the money, it is definitely worth the buy. I'd recommend this any day.